We’re at a stage in the New Orleans neo-burlesque revival where you can catch a bit of corset on almost any night of the week in the Crescent City. And that supply of garters and g-strings and cheeky humor wouldn’t come without a massive demand. Where does this market originate? If you ask us, it’s not just a matter of visitors and locals wanting a bit of noir and naughtiness. Rather, we’d argue that the burlesque renaissance that has swept America has found particular purchase in New Orleans, a city that fits the art of burlesque like a long satin glove just waiting to be playfully tossed aside to the wings of a red-lit stage. It would be impossible to discuss burlesque in New Orleans without mentioning Trixie Minx and the Fleur de Tease burlesque revue. In a city like New Orleans, where there are literally hundreds of regular live acts anchoring the local calendar, it’s an accomplishment to be a blue chip performance. All the more so given that the city’s most famous repeated gigs tend to focus on music, as opposed to the variety show approach of Fleur de Tease. Which, let’s be fair does include music – as well as magic acts, comedy, circus acts, aerialists, and of course, plenty of burlesque dancers. The Fleur de Tease show has become a fixture of the city’s entertainment calendar, and should not be missed – catch a show at One Eyed Jacks. Miss Minx also promotes beloved burlesque shows like the Burlesque Ballroom, which features live music backing and pops off at the Royal Sonesta Hotel; Burgundy Burlesque, a self-described revue for ‘high-end glamorous’ burlesque at The Saint Hotel; and Bourbon Boylesque at Oz, a show aimed at the gay crowd and the more explicitly LGBT blocks of Bourbon St. 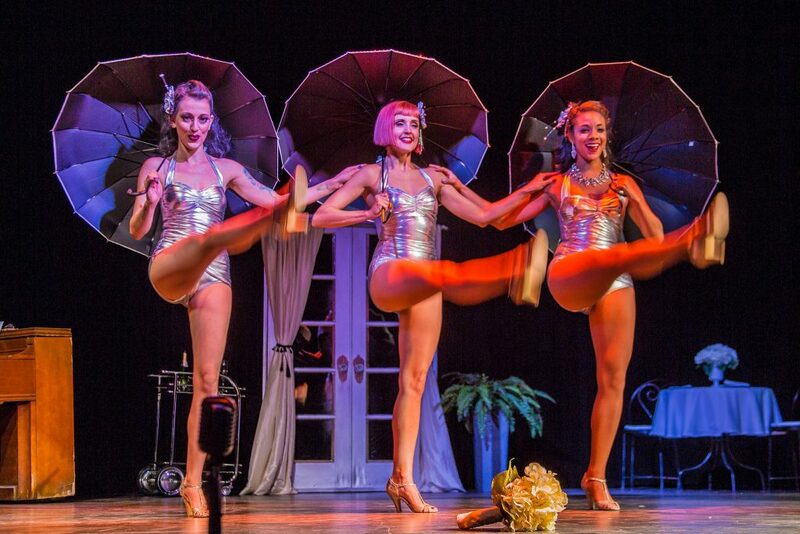 The Ballroom and Burgundy Burlesque shows are notable for their use of backing live jazz bands, a hearkening back to the old roots of New Orleans burlesque, when the shows and jazz music were seen as equally risque. That relationship of shared sinfulness speaks to the importance of burlesque to New Orleans history – and vice versa. As one might guess, the city has a seminal place in the story of this performance art. While the Crescent City didn’t invent burlesque, New Orleans both expanded on the genre, popularized it, and in many ways, mainstreamed it. The roots of burlesque can be traced to early 20th century vaudeville, with its sketch show-esque panoply of multiple-act entertainment, which eventually began to incorporate elements of racy strip tease (the removal of clothes sometimes ‘covered up’ – an ironic term in this content – for the relative lack of skill for early burlesque dancers). When burlesque made its way from the gin joints and booze halls of New York and Chicago to the neon strip of 1940s Bourbon Street, an art form had found the perfect, muddy soil for sprouting. New Orleans, after all, had both the music grounding to provide an excellent sonic backup to burlesque acts, coupled with a sin city reputation that allowed for behavioral envelope pushing. At the time, Bourbon St had only recently become the epicenter of bad behavior in New Orleans, which had shifted from the shuttered Red Light district of Storyville. Live music, neon lights and folks looking to misbehave pushed the business growth of burlesque; New Orleans’ native talent for showmanship pushed, shall we say, the performance’s brand growth. Famous burlesque dancers were soon attended by entourages of makeup artists, backup singers and dancers, managers, club owners and personal stylists. The most famous burlesque dancers had the name recognition of the most famous local musicians; dancer Blaze Starr would become a well-known mistress of Governor Huey Long. Local New Orleans burlesque clubs were raided in the 1960s, effectively driving the art form out of the city (the burlesque clubs and revues were ironically replaced by more aggressive strip clubs). And that was the fate of the art form in this city for decades, until the advent of Hurricane Katrina. In that storm’s aftermath, performers like Trixie Minx began the process of resurrecting burlesque into a sort of millennial renaissance. What we find fascinating is the way burlesque’s twin peaks of popularity in the city reflect two different – yet somehow similar – eras of New Orleans vice. In both periods, burlesque has been about music, wry observation, satire and straight-up stage presence. But in the 21st century, elements and themes of feminism, female sexuality, body acceptance, and empowerment have also taken center stage, as it were. The Allways Lounge The Allways, besides being a great bar, is a live entertainment venue where you may see swing dancing, experimental sound orchestra a la a millennial John Cage, live comedy, drag queen trivia and yes, a fair bit of burlesque. Siberia Conveniently located across the street from the Allways Lounge (the street, in this case, being St Claude Avenue, on the edge of Faubourg Marigny), Siberia regularly features punk rock, bounce shows, and plenty of burlesque revues. This spot also has a kitchen dishing out Eastern European grub, which goes great with a bit of neo-noir cabaret. Bustout Burlesque Another French Quarter classic, Bad Girls of Burlesque perform regular engagements full of spectacle and sheer colorful panoply at the House of Blues. This is one of those regular New Orleans engagements you don’t want to miss. Sobou Not just one of our favorite restaurants in the French Quarter, Sobou also accentuates its Sunday Creole cuisine brunch with a bit of burlesque courtesy of the incomparable Bella Blue.